The Buzz area of the InstantEncore control panel provides dynamic content for your mobile app – in the What’s New section of the home page as well as its own separate Buzz tab. Many artists and arts organizations publish fresh content online through social media platforms and social networks. 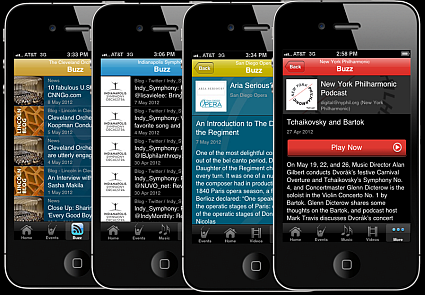 So how can you bring this fresh content into your app’s Buzz area? The Buzz area automatically brings your content into the mobile suite by synchronizing with your content’s RSS and Atom feeds. The best way to automatically pull your social media and social networking content into your mobile app is to identify the RSS feed for your account and add it to the Buzz area. Blog or Podcast – Most blog and podcast platforms provide you with an RSS address so that your followers can subscribe to your content. If you are not sure what your feed address is for your blog or podcast, conduct a search within the platform’s FAQs or in its forum area. Facebook – UPDATE: As of June 2015, Facebook no longer provides RSS or XML feeds for sharing content with web services. Click here for information on how to add Facebook content to your app. Twitter – UPDATE: As of June 2013, Twitter no longer provides RSS or XML feeds for sharing content with web services. Click here for information on how to add Twitter content to your app. MySpace – MySpace provides you with the ability to grab the RSS feed for your MySpace blog. In the top right-hand area of the next page, there are a few text links, one of them says “rss”. Click on that link and the RSS feed address for your MySpace blog will appear in the web address bar. Google+ – Here is the workaround for Google+. Flickr – This one is pretty easy, too. Go to your Flickr photostream page and scroll to the bottom. The RSS feed address for your photostream will appear in the web address bar. Pinterest – For Pinterest, the RSS feed will depend on whether you want the feed for your account or for a particular pinboard. 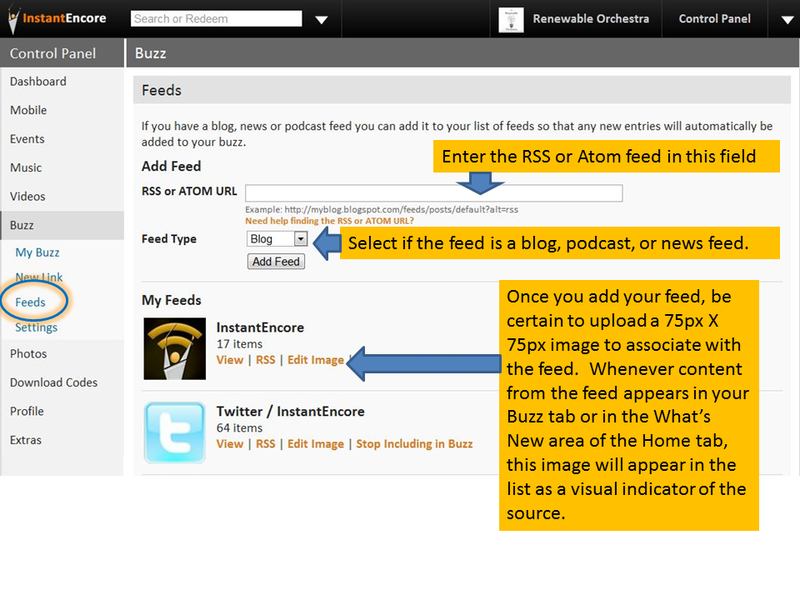 Once you have located the feed for content, go the Buzz area of the control panel. Select Feeds in the submenu. Enter the RSS or Atom feed address in the empty text field. 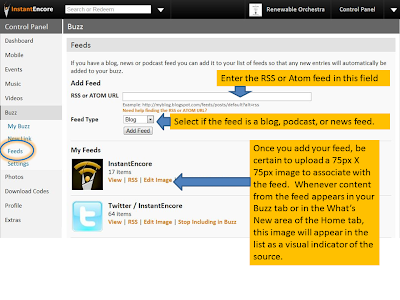 Select if the feed falls into the Blog, Podcast, or News category. Once you have added your feed, be sure to click on Edit Image and upload a 75px X 75px graphic to associate with the feed. (We recommend PNG or GIF image files.) Whenever content from the feed appears in your Buzz tab or on your Home tab, this graphic will appear in the list as a visual indicator of the source. And you’re done! Now, you have dynamic content automatically feeding into the Buzz tab and the What’s New area of the Home tab of your mobile app from your social media account. Take a moment to think about your social media behavior. If you frequently repost items from one social media source to another, then you may not want to add both feeds to your Buzz. This would create redundant content entries. So, if you automatically pull your Twitter posts into your Facebook wall posts, then perhaps you just want to select one of those social media accounts to feed into the Buzz area. In our next post, we will look at two other ways of bringing your social media content into your mobile app. It is important that you vary the content of each social media buzz or site. It is great if your readers, friends, and followers would love to follow you on different social media sites and help you raise your PR and popularity. This can only be achieved if they always look for something new from each of your social media accounts.